Raspberry Pi Piggy Bank with Coin Sorter #piday #raspberrypi @Raspberry_Pi « Adafruit Industries – Makers, hackers, artists, designers and engineers! Check out Alex Stranz’s very cool Raspberry Pi piggy bank with coin sorter! A piggy bank and coin sorter made using a Raspberry Pi, an Arduino, Lego Mindstorms NXT, a coin acceptor, Adafruit’s LCD Plate, and a fingerprint sensor. It counts, sorts, and stores coins. The Arduino is connected to the Raspberry Pi via a USB hub; it communicates with the fingerprint sensor and detects what kind of coin is inserted. A Python script outputs information to the LCD display and stores data in a text file. 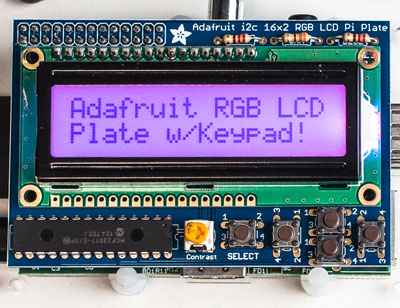 Adafruit RGB Positive 16×2 LCD+Keypad Kit for Raspberry Pi; This new Adafruit Pi Plate makes it easy to use an RGB 16×2 Character LCD. We really like the RGB Character LCDs we stock in the shop. (For RGB we have RGB negative and RGB positive.) Unfortunately, these LCDs do require quite a few digital pins, 6 to control the LCD and then another 3 to control the RGB backlight for a total of 9 pins. That’s nearly all the GPIO available on a Pi!